All goats kept in the UK, whether individual or in a herd are classed as a farm animal. They are therefore subject to the same legislation covering animal health and welfare implemented by DEFRA. 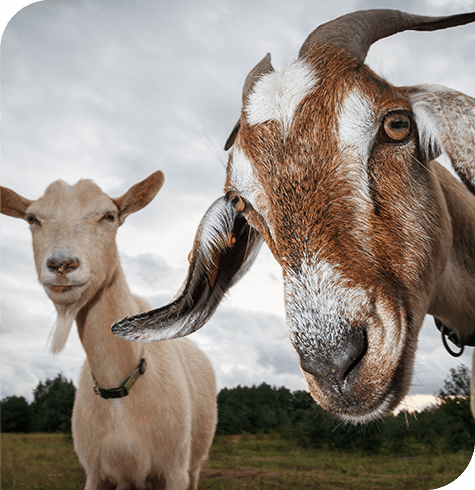 A certain breed of goat may be kept for a specific quality such as milk, meat or temperament. There are 7 dairy breeds kept in the UK, the bulk of these are kept on a commercial basis producing up to 2000 litres of milk per lactation. Angora breeds are preferred for their mohair production. The most common pet breed is Pygmy; this is a small docile breed perfect for small holdings. Goats are susceptible to diseases caused by parasites. Symptoms include weight loss, diarrhoea, anaemia and ill thrift. It is important to control worms with the use of effective anthelminitics. The use of faecal worm egg count monitoring can be used, this allows you to worm accordingly to the worm burden. If you bring a small fresh sample to the surgery, our nurses will conduct the worm egg count and advise you on the correct wormer. At Aireworth Vets we offer a vaccination (Heptavac) for clostridial disease including Tetanus. This is followed by a booster vaccination every 6 months. Pregnant females should be given a booster vaccination 2-4 weeks before giving birth. Kids with vaccinated mothers should start their initial course at 10-12 weeks old. The gestation period for a goat is around 150 days. We are happy to discuss pregnancy in goats and also have the facilities to scan for pregnancy should you require this service.